Last year, my recipe collection was a mess! I had dozens of magazine clippings or recipes scrawled on scraps of paper, tucked away inside cookbooks or crammed into the pockets of binders. When I found a recipe online that I wanted to make, I would write it out on anything I had handy–an old receipt, the back of my shopping list, or a piece of junk mail! The recipes I invented were all jumbled together on one yellow legal pad–the flops sharing a page with the successes. The result of this chaos was that I couldn’t find anything when I needed it, or if I did find it I couldn’t read my writing because the recipe was scrawled in haste (or on too little paper). I made it one of my New Year’s Resolutions to get all of my recipes organized and in a usable format. Here’s the system I’ve come with, and am quite happy with! Instead of having to sort through dozens of paper scraps to find the recipe I needed, I decided to keep all recipes together in one spot, in one uniform size. My mother-in-law gave me a beautiful Susan Branch recipe binder as a wedding shower gift, and this was my perfect solution! The binder is a kit for creating your own customizable cookbook. 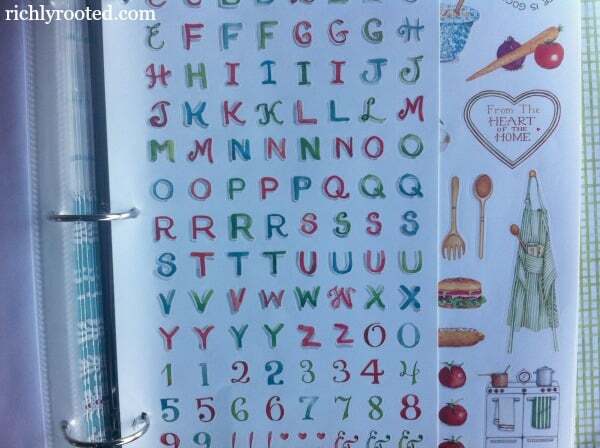 It’s a tabbed, 3-ringed binder with scrapbook-style pages as well as stickers and illustrations that you can use to decorate the book. There are a number of other great recipe binders on Amazon! I bought a pack of sheet protectors and some recipe card protectors to put inside the binder and I was ready to go to work! 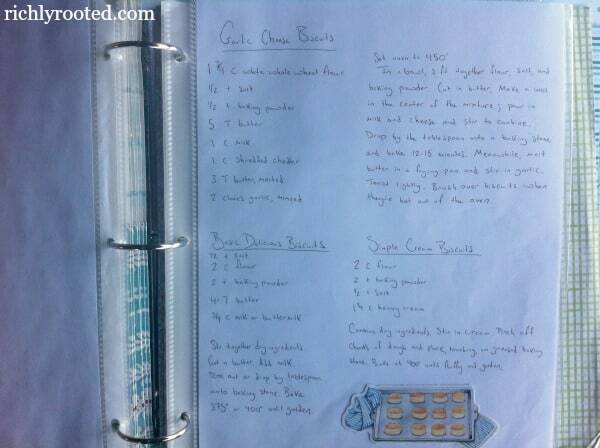 I want my recipe binder to be an evergreen collection–tried and true recipes that I know I’ll return to many times. I don’t want it to be a dumping ground for every recipe I come across or that catches my whim. A recipe only makes it into the book if I’ve tried it a couple of times and we’ve decided it’s a family favorite. If I find an online recipe that I want to try, I work off of my computer the first time I make it. I put my laptop on the side counter (away from the rest of kitchen prep) and make the recipe straight off of the screen. If I find a recipe in a magazine that I want to make, I bring the magazine into the kitchen and work straight off of the page. If I’m inventing my own recipe, I write down the ingredients and steps in a composition notebook as I go along. If we like the recipes I try, but they need adjustments, I make them again in a couple of weeks and experiment to get the taste and process right. If a recipe isn’t a hit, I simply don’t return to it (and since it’s not written down, I don’t have to worry about dud recipes getting mixed in with the keepers). If a recipe is excellent and we’ve adjusted it to our tastes, then and only then does it get transferred to the binder. I use one of the pages or recipe cards provided in the binder–or simply a blank 8.5 x 11 sheet of paper–and carefully write out the recipe, including our adjustments. I often make the directions more concise or include my own methods for cutting back on prep time. Sure, I could simply put the magazine clipping inside the binder–or print out the recipe if it’s online–but I prefer the uniform look of handwriting everything according to the format I like to use. This way I can also write the adjustments right into the recipe, rather than cramming them into the margins. If I’m writing down a recipe from a blog, I usually record the blog name next to the recipe title, even if I’ve made edits. That way I can look up and email the blogger if I ever have a question about their recipe, or simply want to send them a thank you note! I slip the recipe inside a page protector and file it in its appropriate category in the binder. I don’t worry about alphabetizing the recipes, but I do try to keep similar recipes together. So if I have a recipe to write down that uses ground beef, I’ll start a fresh sheet of paper rather than adding it to the page with fish recipes. It’s a little bit more work to write out all of my recipes by hand, but the organization is worth it. Magazine clippings and paper scraps are not a good long-term solution! When it’s time to cook, I just snap the page out of the binder. The plastic sheet protector keeps the page clean. Do you have a good system for keeping your recipes organized? I’d love to hear about it! Thanks! I love looking at it when I pull it out(: I think I need to update it every month or so, to make sure the paper scraps don’t build up again! Elsie, your binder is gorgeous! I have tried many different ways to organize recipes I want to go back to or ways to keep my own recipes but nothing has quite worked as well I want it to. I end up with lists of recipes to refer back to that I will never look at again, way too many printed recipes that are simply too difficult to sort through or scraps of paper laying around that I don’t remember where I put them. The worst is when I make something new or change a recipe and don’t write it down then forget what I did when I want to make it again. I’ll definitely use some of your suggestions when I finally tackle my disorganized recipe collection. Thank you! Yes, I often used to forget where I put a recipe that I wrote down…and for some reason, I would occasionally write down a recipe but not include the title! What in the world?! I had to try and guess what the recipe was! What about recipes from a book? 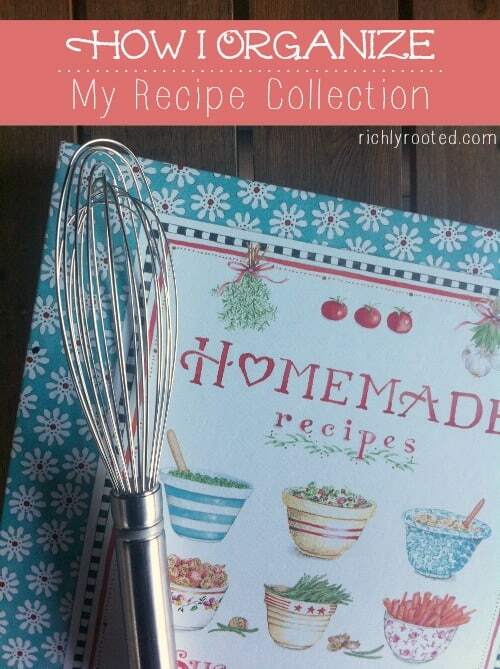 I’ve got three main cookbooks that I love with many good recipes. Maybe write the titles and page numbers for easy remembering?? I tried a binder approach once..it needs a touch up! That’s a good idea! You mean like have an index in your binder with a list of favourite recipes/page numbers from other cookbooks? I like it! I’ve been wanting to do this gor a long time! I have 3-4 main cookbooks, handwritten recipes from friends and family, magazine cutouts,cand a gigantic pile of computer printouts with recipes that I’ve tried and love and that I want to try. 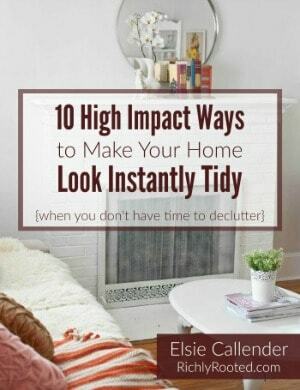 Maybe, you’ve inspired me to start organizing! Thanks! I have a beautiful wooden box that holds index cards. I have pretty much the same filtering process that you have – essentially, a recipe has to be tried and true before entering the box. I agree, Elsie. When my husband’s mother died several years ago the one thing that I got that has meant a great deal is her metal box of recipe cards. First, I was amazed at the selection – not as many as I would have guessed for such a good cook, but every single one of them is quality. 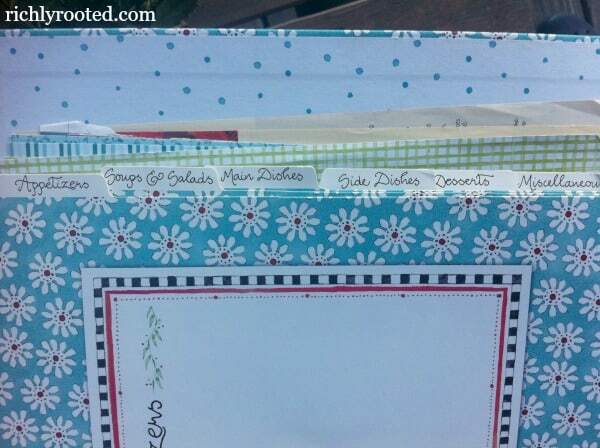 She also had the name of the person she got the recipe from in the upper right corner of every card. It was like a walk down memory lane since I knew most of them. Yeah for great inheritances! And what’s neat, too, is that when these ladies started their recipe boxes they probably had no idea what they would eventually mean to us! Oh, and I really like how you put the date on the card when your son learns the recipe! That is so neat! We are expecting our first son in April, and I want him to learn to cook! My husband and I both love being in the kitchen. I’m part of the way there in a way, but since I have problems with my hands they’re on the computer till I can print them out and put them in a binder. I had so many everywhere like yum print, ziplist, you get the idea I now put all my recipes I want to try into evernote, as soon as I figure out how to transfer the others from yum print and zip list those will go in there too, since reading this article when It comes to print them out I will only print the ones that I will actually come back to, this will save money on Ink as I tend to be a recipe hoarder, wish I could fin someone who would write them out for me. So glad this was helpful! I love Evernote too, by the way! I don’t know if it’s a coincidence or not that I’m reading this and I also read your meal plan post because I received it in my email and of course I read on. I just set up a new meal plan last night, I set it up in an ordinary black small A5 3 ring binder that I had already. I have a happy planner I’m using this year only because I got 2017 & 2018 both on the purchase last year. Love your planner by the way and it will be my next planner purchase but I just seem to notice that when my meal plan is in my regular planner I cannot seem to stay consistent with my meal planning. I set it up with price book but I’m really liking the app you blogged about for keeping our pantry and such stocked and know the prices. Maybe I’ll try it! I have that in the front, then I have my meal plan all on one page, then I have my recipes in the back of it. I went grocery shopping today and found that there was a recipe I want to try and I was unsure of one of the ingredients I flipped right to the recipe and I was able to have it with me in the grocery store. Of course, if my recipes get full I will probably be leaving the recipes at home but it seems to work well and hopefully, I can be consistent about it. One more thing I live a disk-bound planner yours is the one but my question is “can you print the planner and set it up disk bound?’ I know office supply stores do it but I’m in a royal area in Ky. we live in the country and there are no places like that near. We don’t own a vehicle either . We use public transportation because I work from home and my husband uses them for work and I’ll use for shopping and errands. I’m a homebody, love my home and being able to be here daily! Please let me know Elsie and I’ve read some great blogs here tonight! Quite a few bloggers I know already have your planner I’ve seen it around quite a bit. I saw it and said, “this is the one!” I love that it has the bible verse. I think this is the one. 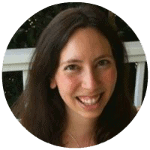 Thanks and great blogging! beehumblewithme.com I hope you’ll visit soon! I like computer printed because I like pictures. Each recipe has a picture! Also magazine recipes I copy them and into the binder they go. Dentists and doctor offices will usually print a recipe for you if you ask. Oh, that’s interesting! Like if you’re looking at a magazine in the waiting room, and run across a recipe you want to make a copy of? I never thought of asking for that, but great idea!